When I was married, I was 22 going on 16. I was very naive and inexperienced, so I didn’t think about things in terms of likes and dislikes, ways of doing things and certainly not ways of thinking. Boy, was I in for a surprise! I suspect Eddie was also, though he doesn’t really talk much about such “inner” things – we were brought up in two different cultures. Yet in many ways, we were brought up with a lot of the same values; that is very important in a marriage. It is only as I have gotten older that I understand the kind of things I would look for in someone. I remember being told that when I found the right man, he would make all my dreams come true. WOW!! What a trip to lay on a guy! At 22 I wasn’t sure what all my dreams were, though I always knew I wanted to find someone who would love me as much as I love him. Score 1 for our side. I also know a lot more now; age, knowledge and experience changes what is important as the years go by. What seemed so important in my 20’s doesn’t seem that much of anything at 66. 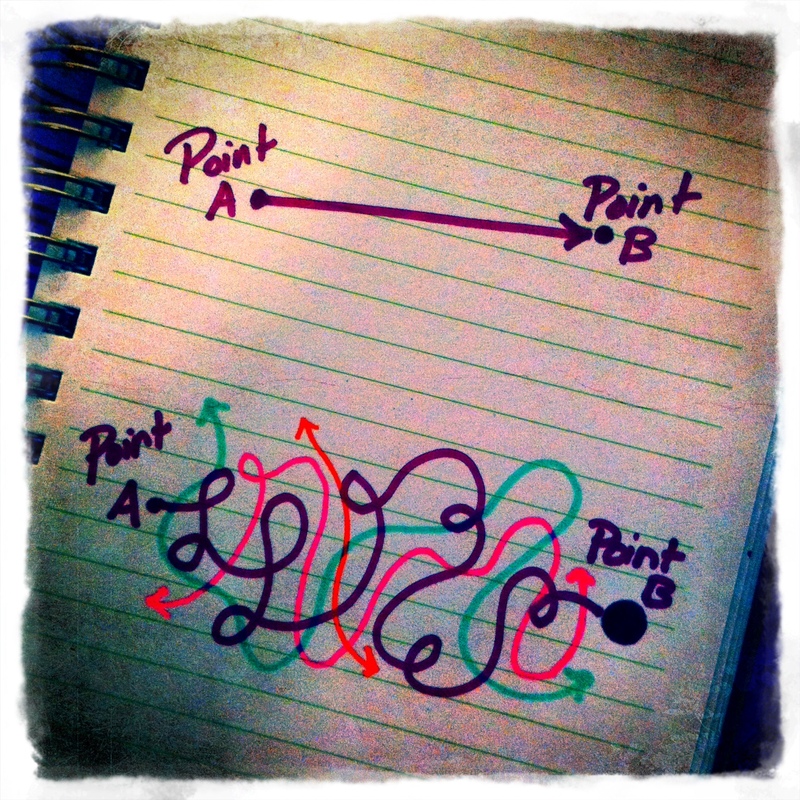 What does that have to do with Scenic Route and Point A to Point B? It took me a while to understand my husband and I are very different in some ways. Physically I like to wander around and see the sights, even get lost once in a while. I would do that each time we moved to a new place – I would find the major North to South road and a major East/West road as reference points. Then when I checked the map, I would see what road was close to my destination. Sometimes I would just head off into a direction to see where it took me; sometimes I came across a familiar road and I would see where it went. Yes, I would get lost, but it was fun and I eventually found my way back home. I would find things or places I wouldn’t have found if I had just gone the usual way. Now my husband wanted the shortest route between 2 points – no muss, no fuss of wandering around all over creation to get there. Yet, there were times when he would decide to go the “back way” – he does have a little scenic route in him. Figuratively he also talks in a straight, to the point way; I tend to go all around different subjects to arrive at the same destination. Maybe I can chalk it up to being a motormouth – I take after my Dad a lot. I wonder if being a scenic route helps me to be more into woo woo, goofball and hocus pocus? My other half tends to see New Age, holistic or metaphysical as goofball stuff. His Point A to B means he wants to see evidence he can see or hold in his hands . I suppose it is called linear thinking. I am learning that there is all kinds of things in this world and other worlds; so when something or someone comes along with a “harebrained idea”, I now more likely see it and not automatically think it’s crazy. I may not understand or believe it, but I am willing to learn more about it. This certainly is no criticism of my husband, I’d say we keep each other balanced because we are opposites in some ways. We have learned from each other and then not agreed after, but there is some give and take between us. I will admit, woo woo tends to make him dismiss out of hand – his choice. He doesn’t have to agree with me, nor do I have to agree with him on everything. We will agree to disagree on some things. This is one of those times when I have run out of steam – no doubt later on I will think of more to say. This entry was posted on October 20, 2013 at 4:16 pm and is filed under Musings. You can follow any responses to this entry through the RSS 2.0 feed. You can leave a response, or trackback from your own site.